Let’s say you’re with your friends and want to groove to a particular song. Unfortunately, no one has got a speaker; though, each of you has got a smartphone. Now, if you can play the same song on all the smartphones, the sound will be amplified, and all of you will have a good time rocking to your favorite music. Seems like a brilliant idea. Only, it’s not easy to play a song in sync on multiple devices. The song you want to play might not be available on your friend’s device. Even if it is, hitting the play button at the same time on multiple devices is hardly possible. The more the number of devices, the more the possibility of playing out of sync. In the end, all you hear is some out of rhythm “noise”, which kinda ruins the party mood. Well, you no longer need to be worried about playing songs in sync on multiple devices. AmpMe is here to help. AmpMe is a mobile app available for iOS and Android that syncs audio/video playback on an unlimited number of devices, turning them into one big speaker system. 1 How does AmpMe work? 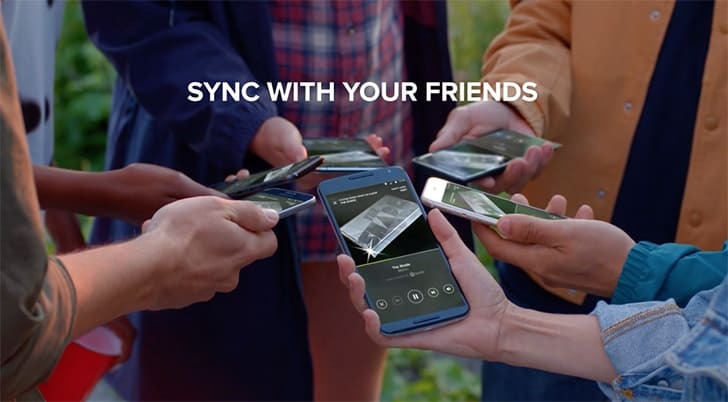 The idea of playing the same music in sync on multiple devices sure sounds exciting. But how does AmpMe pull it off? First off, AmpMe uses your device’s location to detect other nearby devices. If all the devices are connected to the same WiFi Network, the app uses that to stream audio across all the devices; otherwise, it uses the devices’ Internet connection. Note: AmpMe may consume cellular data, if all the participating devices are not connected to the same WiFi network. Download and Install AmpMe from the App Store or Google Play Store. Open the app and click on the appropriate option under “Start a new party” (Spotify, YouTube, Music Library, SoundCloud) to host a party. Tell your friends to open the AmpMe app and join your party. Alternatively, you can also join other parties hosted by your friends nearby. Wait for the devices to sync up and start playing. That’s it! In a few seconds, all the connected devices will start streaming the song in sync. Note: In case one or more of the devices are not in sync, you can tap on the Sync button and manually adjust the offset to match the others. You need to wait a second or two after adjusting the offset, for the changes to take effect. AmpMe also works with Bluetooth speakers. If you are the host, you can connect your device to a Bluetooth speaker to play music through it, along with other devices synced via AmpMe. It’s a really handy app to take your friendly get-together to the next level. Know of any other apps, similar to AmpMe? Let us know in the comments below.